Many thousands of Gazans face a freezing winter living in tents pitched amid the rubble of their ruined homes – as the UN is urging half a billion dollars in emergency aid for shelter to the war-battered region. More than four months after the 50-day summer war with Israel, 17,000 Gazans still remain displaced, having to live in temporary shelters. A total of 120,000 homes are estimated to have been destroyed in the Israeli air strikes that claimed 2,000 Palestinian lives. Hammash refers to last week’s winter storm, which killed three infants who froze to death. Gale force winds then brought with them freezing temperatures and torrential rains which led to large areas being flooded. The enclave’s crippled infrastructure aggravated the impact from harsh weather conditions. “It’s very tough for us here. As you can see we have no water or electricity. We are suffering badly,” an elderly woman, Aum Jalal Gunnita, told RT. The situation is catastrophic, according to Amjad Al Shawa, a human rights activist and head of the Palestinian NGOs network in the Gaza Strip. He says shortly after the war the international community vowed to help Gaza. It’s still only a promise, though. Spanish Foreign Minister Jose Manuel Garcia-Margallo, who visited Gaza on Tuesday, urged the international community to “act rapidly to rebuild Gaza." 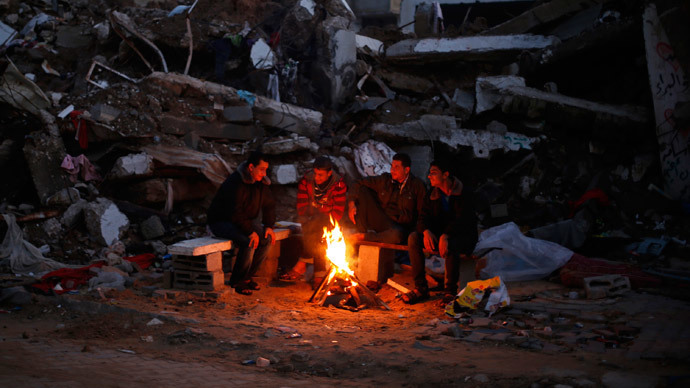 "The inhabitants of Gaza are living through a real tragedy," he said, AFP reported. Garcia-Margallo traveled to the war-battered region together with Pierre Krahenbuhl, the commissioner general of the UN agency for Palestinian refugees (UNRWA), who warned of “negative consequences" in case reconstruction is further delayed. The agency said it has only received $135 million from the international community, and was facing “a funding gap of $585 million for shelter assistance." UNRWA says it will run out of money for the Gazans in February. The money it has so far received was distributed among 40,000 families who desperately need to repair their homes. One of the factors hampering the reconstruction effort is Israel's blockade of the territory. There’s no relaxing of tensions between Israel and the Palestinians in sight, now that the successful Palestinian bid to join the International Criminal Court have only added to straining relations between them.